As Echo and I ventured up into the above ground station I began to load up Google Maps on my phone. While this was a planned venture off-station, that didn’t mean I knew where I was going. However, as we got to the surface, I remembered that this station was still outstanding, and now would be the perfect chance to pup it. So the hunt for a sign began. Of course, being a Network Rail owned terminus station, all the signs are all the way down the end of the platform! Thanks guys! We then took the chance to pose with Paddington Bear (as you do), and coo briefly at the boarded off CrossRail developments taking place. The reason for going above ground was to hunt down the infamous non-building of 23/24 Leinster Gardens, a short walk away and about halfway on the way to Bayswater. The address is one of the examples of how the London Underground functioned back in the days of steam, with the houses being demolished to make way for a vent to expel smoke and steam from the locomotive’s condensing gear. To preserve the look of the street, a facia was erected to imitate the look of the houses on either side. By going around the back, the truth is revealed. We soon found it and got some video in the area before walking to the next station. Our tour continued anti-clockwise! 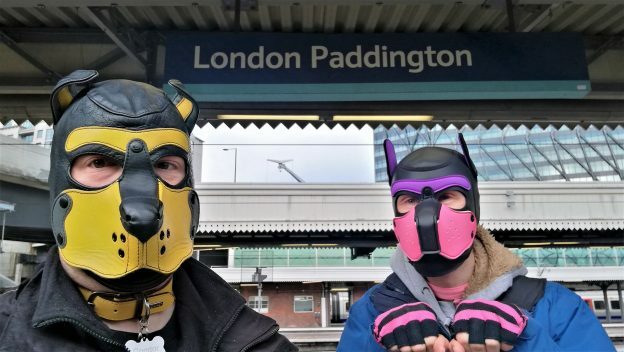 Wruff Spice visited Paddington on 31/12/2018 and took his photo after a little encouragement from Twitter. Click to visit his Twitter post. This entry was posted in 4) National Rail, London Station on January 23, 2019 by CondorBriarpup.